« Did the French Invent ‘German’ Bratkartoffeln First? Please give me an idea for a dish that is a) delicious b) easy to make c) something my boyfriend will actually like and d) something my boyfriend will actually like. As it’s nearly Easter, the ingredient ‘chocolate’ immediately sprang to mind when I was pondering what to bake. 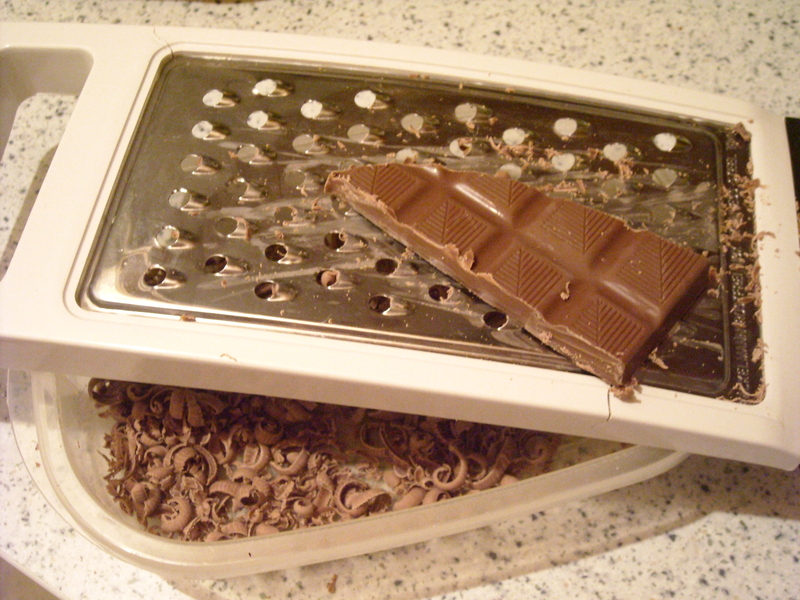 Although there are only a handful of chocolate recipes in Household Management, I finally managed to find something that I had no doubts would be universally popular in our household. “I’m not sure I like soufflés,” muttered my boyfriend under his breath when I first mooted the idea. Oh dear. Well, I was pretty sure Mrs Beeton and I could change his mind with this one! INGREDIENTS – 4 eggs, 3 teaspoonfuls of pounded sugar, 1 teaspoonful of flour, 3 oz. of the best chocolate. The whisking, as always, was the most time-consuming part (“I think we should get you one of those electric mixers,” he commented as I shoved the bowl of egg whites into his hands and begged him to take over for a few minutes). And, for a Mrs Beeton dish, there was surprisingly little fat or belly-expanding ingredients. Which should have given me a heads-up as to how it would be received by my dear Hausherr. However, I decided to persevere all the same. 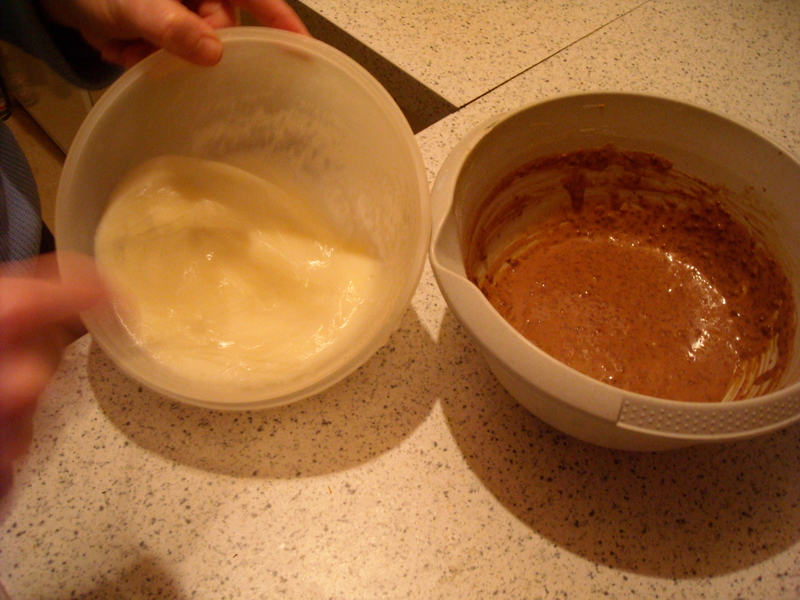 As soon as all ingredients were mixed and beaten together, I popped the mix into two small pudding dishes and slid them into the oven for the required 20 minutes. After almost 15 minutes, they still hadn’t begun to rise. The unmistakeable whiff of scrambled eggs began permeating throughout the kitchen. Oh no, I thought. 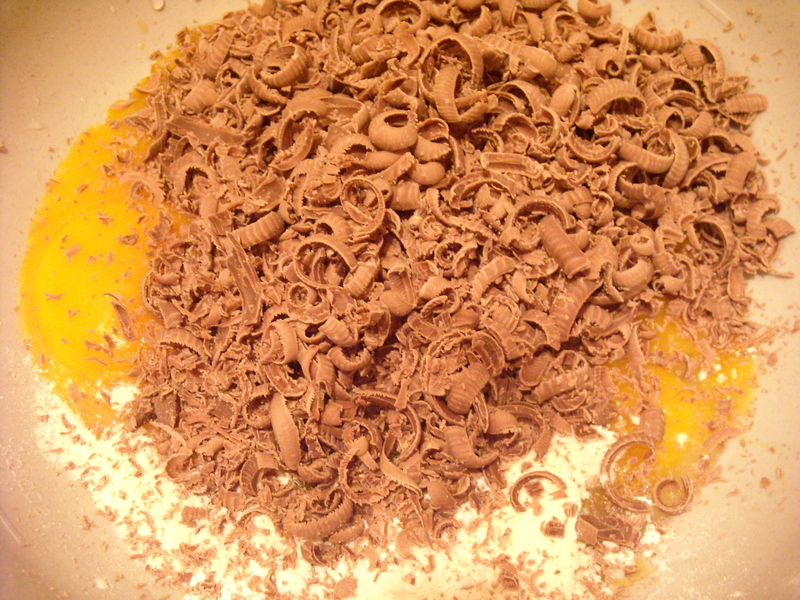 Please tell me I haven’t made chocolate scrambled eggs! I continued to watch the oven with trepidation, silently willing the damn soufflés to rise. Finally, they began to dome upwards. I gave them another few minutes, then got them out of the oven in a jiffy and called out for my boyfriend to hurry in and to try some. “Hmmm,” he mumbled, as he slowly took another spoonful and popped it into his mouth. “Well I think you’ve done a great job, super!” he smiled brightly (I’ve noticed recently that he’s trying to be more positive). Which, I have to admit, was true. 150 years ago, when sugar was not used as plentifully (dare I say, wantonly), I guess sweet tooths were more easily satisfied. 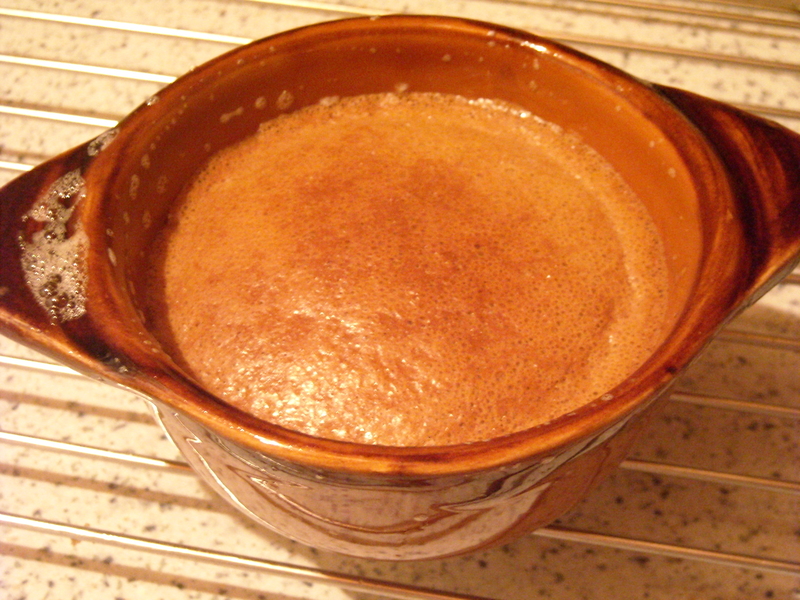 But to today’s tastes, the soufflé was a little on the plain side, sweetness-wise. As for me, I rather liked it (especially as I complemented it with some chocolate-vanilla ice cream). My boyfriend, however, plowed on for another few spoonfuls before giving in. So, if you haven’t got an overly sweet tooth, this dessert will probably be to your liking. If you have, another spoonful of sugar wouldn’t go too far astray. This entry was posted on March 31, 2010 at 5:59 pm and is filed under food. You can follow any responses to this entry through the RSS 2.0 feed. You can leave a response, or trackback from your own site.